ARE YOU CONFUSED ABOUT YOUR STAND WHEN IT COMES TO ABORTION? The Bible makes it clear that life begins at conception, not merely at birth! An unborn child’s worth is invaluable before God. 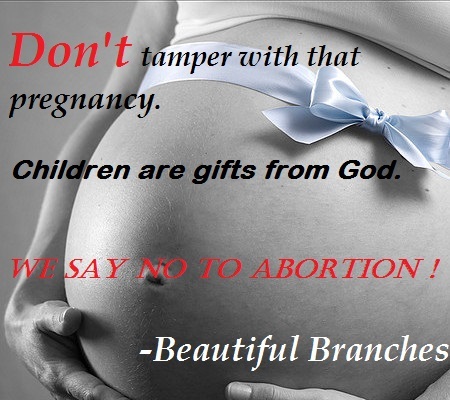 God has a plan for that unborn child as much as He does for you! You made all the delicate, inner parts of my body and knit me together in my mother’s womb. Thank you for making me so wonderfully complex! Before we were born, God knows us personally and intimately. Who would dare to kill a friend of God, even an unborn friend? Abortion is taking the life of an unborn human being; it is murder and it is absolutely wrong. God forbids murder! Stand for the truth! Lead those going astray through the right path. Don’t stand idly, saying you are not directly involved with abortion- which is murder. Ye are the light of the world; let your light shine! Light up this dark world. For God understands all hearts, and he sees you. He who guards your soul knows you knew. However, if you have been a part of this ungodly act; (either the one who aborted a pregnancy or the one who advised or supported someone to) if you are still dealing with guilt, know that no matter how great your sin, God’s forgiveness is even greater. Don’t let the devil tie you down with that guilt. Accept God’s forgiveness, purging and cleansing and live the life of an overcomer. “Though your sins are like scarlet, I will make them as white as snow.